Top quality, we have Crew neck, V neck, Vests, with patterns, classic, moderns, fashion designs, 100% baby alpaca, alpaca. The wide variety of colors. You will receive a gift with your purchase. All with free shipping. Top quality alpaca, we have a great selection of the best designs in Jackets and sweatshirts, perfect for every season. You will receive a gift with your order. All with free shipping. Top quality, we have many classical designs, the same handcraft used by centuries, very warm, wide variety of colors. You will receive a gift with your purchase. All with free shipping. You will love the Andean Jacket Ayacucho ,a beautiful jacket with andean fabrics, fabrics that use the Inca Royal Family, you can combine your clothes easily with it. Products comes with a free gift. Andean Ponchos made of Andean Fabrics ,very warm, with andean designs . 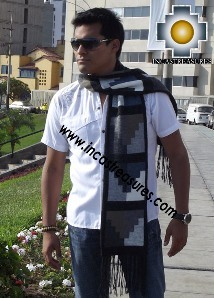 Our skilled artisans prepared in a material that use the Royal Family of the Inca Empire, all with a free gift. Alpaca socks, we have 7 designs and models ,very originals for you. Comfortable, perfect to your winter nights, all with a free gift. Alpaca blankets, we have many designs and colors ,very originals for you. Comfortable, perfect to your winter nights, all with a free gift. - Carefully made ,very soft. - Durable enough to wear a long time. - The prefect gift any season.